Wahama shortstop Ashtyn Russell prepares to snag a line drive during the sixth inning of Friday night’s Class A Region IV, Section 1 softball contest against Wirt County in Hartford, W.Va.
Wahama senior Autumn Baker knocks in a run with ground ball during the fourth inning of Friday night’s Class A Region IV, Section 1 softball contest against Wirt County in Hartford, W.Va.
HARTFORD, W.Va. — A few days late, but a lot better than never. 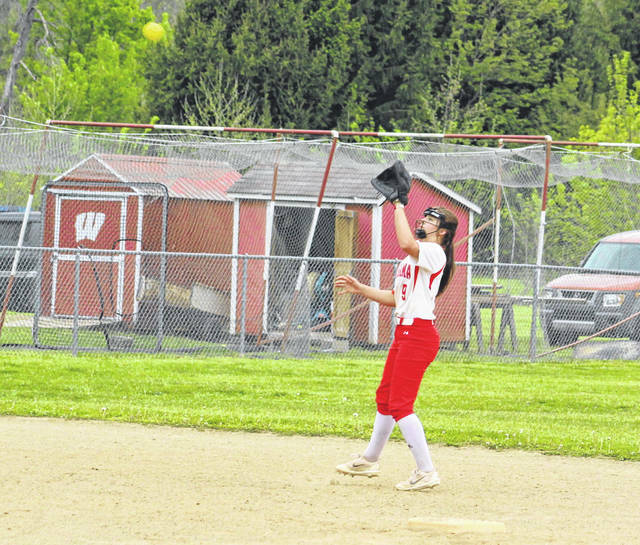 After being knocked off by Wirt County in the postseason opener, the top-seeded Wahama softball team exacted a little revenge while keeping its season alive on Friday night with a 7-1 victory in the Class A Region IV, Section 1 loser’s bracket final played in Mason County. 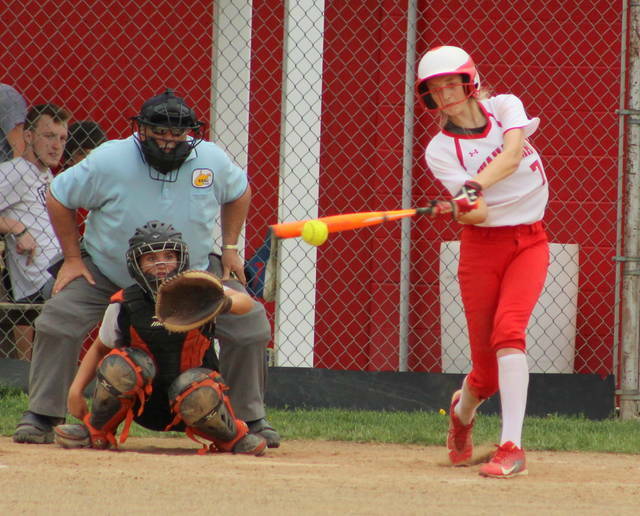 The Lady Falcons (18-11) trailed 1-0 after a half-inning of play, but the hosts countered with seven unanswered runs between the second and fifth frames en route to building a six-run cushion. 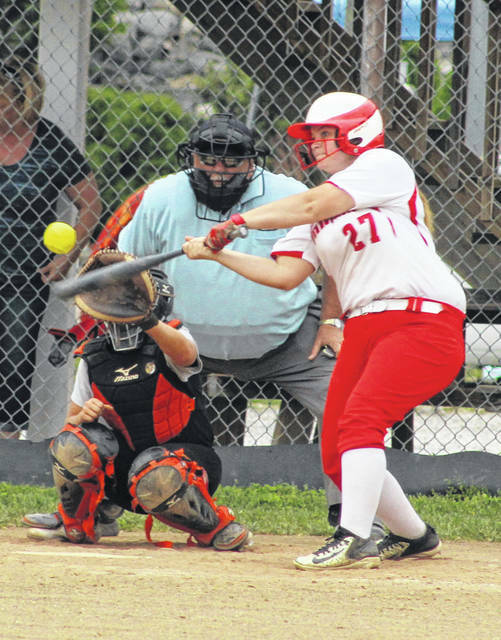 The third-seeded Lady Tigers (14-9) — who defeated Wahama 12-11 on Monday — went down in order in both the sixth and seventh frames as the Red and White retired the final eight batters of the game. The win allowed WHS to advanced out of the loser’s bracket final and into the championship game, which is scheduled for 5 p.m. Monday night at Calhoun County. The fifth-seeded Lady Devils (8-12) — the lowest seed in the five-team bracket — is still unbeaten in Region IV, Section 1 postseason play. The Lady Falcons need a victory over CCHS on Monday night to force a winner-take-all scenario on Tuesday, but that game would be end up being played at 5 p.m. in Hartford. A Wahama loss Monday night ends the tournament as well. WCHS produced three consecutive one-out singles in the top of the first, with Maddy Richards providing the last of the trio out to center as Kassidy Root scored for a 1-0 edge. The Lady Falcons rallied to knot things up in the bottom of the second as Maddy VanMatre started the inning with a double, then came around on an Ashtyn Russell single to left-center that evened the game up at one. Wahama made its big breakthrough in the third after loading the bases with nobody out, then Emily VanMatre dribbled a ball to short that didn’t result in a force out. Grace Haddox scored on the play, giving WHS a permanent lead at 2-1. Maddy VanMatre popped up out to second for the first out of the inning, but Hannah Rose tagged and scored on the play. Russell also hit a sacrifice fly to shallow left-center that allowed Emma Gibbs to score for a 4-1 contest through three complete. Hannah Billups started the bottom of the fourth with a triple, then came home on a Autumn Baker ground out that made it a 5-1 game. Emily VanMatre and Russell scored the final runs in the fifth as Victoria VanMatre doubled to left-center, wrapping up the 7-1 decision. The Lady Falcons outhit the guests by an 8-5 overall margin and committed only one of the three errors in the contest. Wirt County stranded six runners on base, while the hosts left only four on the bags. Wahama’s only error came with one away in the fourth as Kayla Randolph reached safely, then moved to second on a Maggie Bailey single. WHS followed with a textbook 4-6-3 double play to get out of the jam, and allowed only two baserunners the rest of the way. Afterwards, Wahama coach Mike Wolfe was pleased with the outcome, particularly from the defensive perspective. After all, going from a dozen runs allowed to a single run is a pretty significant improvement over a three-day span. Rose was the winning pitcher of record after allowing one earned run, five hits and two walks over seven innings without recording a strikeout. Richards took the loss after surrendering five earned runs, eight hits and one walk over six frames while fanning four. Rose paced the Lady Falcons with two hits, followed by Gibbs, Russell, Billups, and the three VanMatres with a safety apiece. Russell and Victoria VanMatre each drove in two RBIs. Richards led WCHS with two hits, with Emily Cottrell, Skylar Bogan and Maggie Bailey with a safety each. Richards also accounted for the Lady Tigers’ lone score.